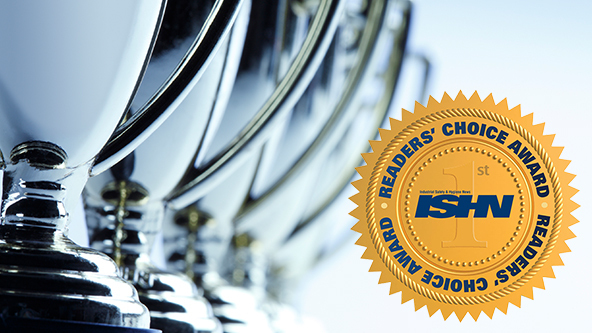 Chicago (May 23, 2017) — VelocityEHS, the leading cloud environment, health, safety (EHS) and sustainability software provider, today announced it has won two Industrial Safety & Hygiene News (ISHN) 2017 Readers’ Choice Awards. VelocityEHS took top honors in the EHS Management Software category for its environmental management capabilities, while its MSDSonline chemical management solutions took top honors in the MSDS Management category for its newly enhanced and widely-used chemical management mobile app. The two VelocityEHS solutions recognized by ISHN readers are aimed at helping companies improve EHS performance across their entire organization. The VelocityEHS Environmental Management capabilities – comprised of its Air Emissions, Water Quality and Waste Compliance modules – automate data collection from all sources and perform calculations in real-time to make it easier and more cost-effective for companies of all sizes to manage complex environmental compliance monitoring and reporting activities. Readers also acknowledged the company’s MSDSonline Chemical Management mobile app, which gives workers direct access to critical chemical safety information on their mobile devices, whether online or offline so even those working in remote areas or in facilities where wireless signals are blocked can perform their jobs more safely. The app is one more way VelocityEHS makes it possible for safety and risk management to be shared responsibilities throughout an organization. A full list of ISHN 2017 Readers’ Choice Award winners is available at www.ISHN.com.